A high end stereo four band inductor based parametric mastering and recording equalizer, that operates and sounds like no other. The REQ-2.2 equalizer utilises parallel resonant circuits in a clever configuration whereby the bandwidth (Q) of the circuit can be adjusted like an active filter, but without any complex relay switching. 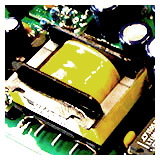 The inductor/capacitor resonant "tank" eq circuit runs at a low internal signal level which avoids any inductor saturation effects. The overall result is the sound of real choke based filters with a big open sound, but without the limitation of only a few - or no bandwidth selections as found on traditional choke eq's. As you would expect, the REQ uses our BE40 True Class A circuits developed for the MA-2.2 microphone amplifier for the best possible audio performance that mastering engineers desire. But sometimes you might need a bit more color, so we have included a saturation section that introduces measured amounts of low frequency harmonic distortion via a steel audio transformer driven by a single ended tansistor amplifier. The High Pass Filter is placed in the beginning of the eq chain and the Low Band eq section is placed last in the chain. This layout produces the best overall equalizer coherency. The large knobs and positive feel of the switching make the REQ a pleasure to operate and everything is visually clear when mounted into a console. In total there are 72 frequency choices per channel with overlapping selections across the four bands so you can always find the centre frequency you are looking for. A looping line XLR input and two parallel XLR outputs provide flexible connection options in the mastering control room. Finally, the brushed aluminium low glare rustic silver finish and retro Elma knobs give the REQ an impressive look in your rack! 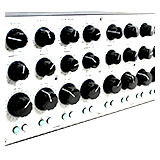 Each eq band has a 12 position switch to select the Frequency and another that selects the Bandwidth of the bell shape curve (Q) which is adjustable from 1/3 octave to 2 octaves wide. On the High and Low bands, the Bandwidth control reverts to shelf Slope control when Shelf mode is selected via the push button switch (not with the Active Low Band option). The Low and High Mid bands frequency range is changed to alternative selections when the Freq x2.5 mode is selected. Each band also has an in/out switch. 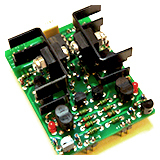 The mastering version Boost/Cut control is a 23 postion Elma switch with a range of +/-8dB. 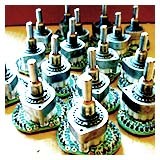 The recording version is fitted with a Alps center detent pot with a range of +/- 15dB. On the right side of the front panel are the High Pass Filter and Saturation controls with their own in/out switches. The overall System in/out controls and the power switch complete the picture. The channel A and channel B push button switches in this section can be grouped by holding down any switch for 5 seconds. This means for stereo work you only need to push either the channel A or B switch to change both channels simultaneously. (This feature only applies to units with serial number Q1110 and up). The REQ equalizer is available in a mastering or recording version with different boost/cut ranges as noted above. The High Pass Filter section of the mastering version has a softer slope (12dB/oct) compared to the recording version (18dB/oct) and the cutoff frequencies are more applicable to the mastering process. We are now offering an option for the Low Band section of the REQ. This option replaces the Choke based eq filter with an Active filter which provides a "tighter" bass sound. This option has come about from requests from some users who work with modern music styles in mastering. 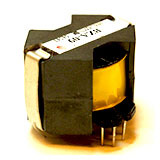 The only operational difference between the Active and Choke filters is in Shelf mode, the Bandwidth control does not work as a slope control and is disabled. The Active Low Band cards can be easily fitted to existing units and you can purchase the kit online here. Download the instructions to fit these cards here. We have in the past supplied custom front panel finishes and custom mastering boost/cut ranges, please feel free to contact us to discuss your desires. If you are looking for the REQ upgrade info it is here. I recently sold my beloved solid state Pultec EQP1A3 equalizers so I was in the market for a new unit to fill the empty void left in my mastering rig. Unlike my old Pultec program equalizers, this time I wanted something with more surgical precision to it. If at all possible, I wanted something with a bit of that Pultec "musical mojo" as well. Perusing the specs of the REQ 2.2 it looked like this unit might just be what I was looking for. I contacted Buzz Audio's owner and designer of the REQ 2.2, Tim Farrant, to see what the chances were of getting a unit in for evaluation. Tim was in the process of building the first mastering REQ 2.2s and would be sending one of the units to Nathan Eldred at Atlas Pro Audio to send around. 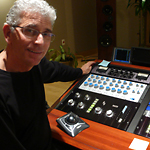 Unfortunately it was already committed to another mastering engineer David Greenberg of Sonopod Mastering. After a month of waiting, I finally got the unit in and it was well worth the wait. Just looking at the unit, the Buzz Audio REQ 2.2 makes quite an impression . Not only is the build quality impeccable, but the blue colored knobs and two tone milled aluminum front panel makes the unit jump right out of the mastering console. With four equalization bands per side, 72 frequency points, bell and shelving switches on the hi and low bands, Elma (or Palazzo) precision stepped attenuators, separate high pass filter section and a unique set of switches called Saturation, the unit makes for one powerful equalizer. Speaking of the Saturation control, this puts a steel transformer in the output signal path which changes the color of the EQ. Or should I say, it gives the EQ color. That's not to say that the standard signal path doesn't sound beautiful on its own, it does but in a very precise musical way. Not too clinical or boring... just "right". When engaged, the Saturation control adds that touch of vintage "musical mojo" I was looking for. I find this feature even more useful than the Pultec "transformer" trick ever was in that you can control the amount of saturation provided by the transformer. Where this feature really shines is on low end instruments like bass guitar or kick drum (just where one might use a Pultec). It tightens them up and gives them a much more solid feel while retaining a smooth top end on the rest of the program material. It's as if you boosted the low end on one of the equalizer bands and to a certain extent, looking at the graphs (provided in the exceptionally well written manual) you can in fact see that this is part of what is going on but with more of a 3D effect than just boosting an EQ point could do alone. In fact I just used this feature to great affect on over 50 comedy musical cues for an upcoming Hollywood movie that were composed using mainly sampled drums. I have to say right here that trying to write about how an equalizer sounds or doesn't sound is very much like "dancing about architecture" as Frank Zappa once said. How do you describe the indescribable? My solution was to hear this mastering equalizer against as many other mastering equalizers as I could. Enter Dave McNair and his gracious offer to host a little listening session in his room at Masterdisk Studios. I took the REQ 2.2 down to Masterdisk in NYC and we set the unit up in Dave's room. Dave has several well know mastering equalizers in his room and we set about testing the REQ 2.2 against them. Upon first listen, we were both impressed by how the EQ sounded. Throughout the time we were there, several of Masterdisk's other mastering engineers came into Dave's room to try the Buzz REQ 2.2. The one comment I heard over and over again from all the different mastering engineers was that the top end sounded just like the Sontec. A very high compliment indeed. Andy VanDette went as far to say that "many [other mastering equalizer manufacturers] say their EQ's sound just like a Sontec but this unit really nailed the top end." I'd have to agree. With most other mastering equalizers I've owned in the past, none of them could easily be used to great affect for raising the high end in shelf mode. They all seemed too heavy handed or unnatural sounding (the one exception being the Sontec). The REQ 2.2 is very natural sounding in doing this, never does the top end sound sharp or razor blade like... no "poke in the ear with a sharp stick" sound here. I find myself using shelf mode more often than ever before with exceptional results. When I asked Tim why he chose to use resonant filters to do the actual equalization, his explanation was simple, direct and rather enlightening at the same time. 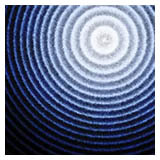 "Why resonance? Well this pertains to the use of real chokes and capacitors as the filter elements. Filter circuits used in the GML or Sontec are "electronic" simulations of real inductors (or chokes) so you make a capacitor/resistor network look like a choke. These are easier to manipulate than real chokes. I wanted to make an EQ with the real thing!" Now it made perfect sense to me why the Buzz REQ 2.2 sounded better than most of the units I was shooting it out against. No op-amps here, instead the Buzz designed BE40 amplifier and real passive chokes. As stated on the Buzz Audio website "The passive resonant filters coupled with our True Class A BE40 amplifier technology yields a unique product with exemplary sonic performance and a new definition of tonality." I whole heartedly agree. However, implementing this kind of technology doesn't go without some minor negative trade-offs as well. When you engage the individual bands or the overall EQ, a slight delay (10 mS) is caused due to the internal relays. This basically means when you engage the EQ on, in the middle of dense program material being played a slight popping sound might happen. It also means when auditioning the EQ using the on/ off buttons you'll want to make sure you engage the buttons with the timing of the music being played. This becomes less of an issue when used in conjunction with a true mastering console and using the console's send and return section to put the equalizer in line. Encouraged by the positive results at Masterdisk, I took the unit back to Silvertone for further "real world" evaluations in my own environment. After using the REQ 2.2 for over a month I find this unit has one of the best tactile layouts of any equalizer I've ever used. On/off buttons that light up for each channel, overload indicators for each side (this is really a nice touch and more useful than one might expect). Individual on / off buttons for each band. Separate switches for both the high pass filters and the saturation section (selectable over 6 different "presets" ) again with illuminated buttons. A nifty little feature found on the back of the unit is the "looping" input which allows you to daisy chain the REQ 2.2 with other audio devices. It also has two output connectors (paralleled) enabling you to feed two different separate devices. The high pass filter is very complete in the mastering version with frequency ranges at 20, 26, 34, 46, 58 & 70Hz. It should be noted here that these are different on the studio version as is the amount of cut and boost allowed; + or - 16 dB with continuously variable steps on the standard version while the mastering version is + or - 8 in half dB steps. Using the high pass filter on this EQ seems more heavy handed than say the Weiss EQ but the overall effect is more pleasing to the ear. Very hard to describe but the REQ 2.2 seems to retain more of the musical sense of the low end while cutting than just about any other equalizer I've owned before. It takes out the low end muck without taking out the low end feel. I also found the precision I was looking for in an analog equalizer again. This thing rivals my Weiss digital EQ in many ways, however it conveys more of a smooth wide open sound and less of a clinical sterile feel that digital equalizers can sometimes convey. You really have to hear this and A/B it for yourself but whatever frequency I chose and then matched it on the Weiss, there was always a more open musical feel to what I was boosting or cutting on the REQ 2.2 with minimal phase shift around the chosen bands. Impressive to say the least. With each source I tried the equalizer on, I came up with exceptional results prompting me to smile every time. In the end I figured with the amount of joy this unit gave me she was well worth the price of admission... so I bought the evaluation unit. I can't think of a higher compliment to end a review with.